Mobility, flexibility, strength, coordination. You’ll need all of these qualities in order to set your body in motion. Right from the very young age, we are gifted with the unique ability to move in a very complex way. The ability that most us manage to lose and simplify it to the activities like the walking or sitting. The difference between mobility and flexibility is that mobility is ‘active’ range of motion. Meaning that strength is exhibited. For example, standing weighted shoulder extension. Flexibility, on the other hand, is ‘passive’ range of motion. Passive means strength is not exhibited and is dependent upon gravity or some passive forces. For example, supine shoulder extension stretch. But, let’s leave the definitions and think of movement and mobility as one word. The word that will describe our ability to develop complex coordinated movement patterns as something important for our physical and mental development. It is a dumb question, really. But unfortunately, today we live in the world where one of the most basic functions of our bodies became a topic of reinvention. The world where the importance of mobility is defined as the ability to walk and sit down on the chair without pain. Today even active people’s movement is rarely challenged by more than fitness world standards created for esthetics. We simply want to impress with a physique which often lacks this most basic function. For most adults, the simple Skin The Cat movement that can be done by almost every kid in the playground without prior training, became a challenge that requires time and preparation in order to be safely reintroduced as the part of the activity. The kids are the best proof that we are all created with the strong, functional and freely-moving body. 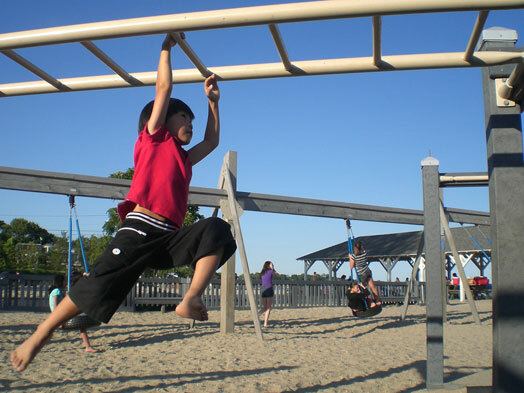 Just spend a couple of minutes with an active child and see how easily they are able to travel across the monkey bars demonstrating full shoulder flexion and mobility in their upper backs. Squatting for a prolonged period of time or bridging is for them a natural ability that they unconsciously perform while playing. No, we don’t simply lose it just because we get older. Sedentary lifestyle, inappropriate training technique, activity specialization where we overemphasize one movement over another. All these bad habits and lack of using our joints to their full abilities often create imbalance, encourage a bad posture and can result in different kind of injuries. The final answer to this question would be- mobility is simply part of our existence. We are meant to move. It facilitates our daily activities and makes our life easier. Being mobile not only can prevent injuries and allow you to build strength through a full range of motion, it can also save your life. Mobile, coordinated body has more chances to survive a fall, eg. in a bike accident. Movement is also a lot of fun. Learning and being able to perform a backflip and other fun moves will definitely keep the smile on your face. Despite the fact that we have managed to learn how to lose it over time, the simple solution to the problem would be to prioritize the mobility in our training. No “a few sets of 30-seconds” after your training will not be enough to fix the years of physical inactivity or bad habits. From my experience 3-4, dedicated passive stretch sessions together with frequent limbering throughout a day and integrated weighted mobility drills into your workout are a must for anyone who wants to reverse serious inflexibility and wants to take their training to another level. Adding basic movements and acrobatics to your routine will further compliment your training. You don’t need to be a gymnast but a sheer fact that most of the adults can’t even do a forward or backward roll is a disgrace and lack of respect for their own bodies. Do gymnastics, Capoeira, climb, dance, take up the BJJ classes. Experiment with movement and stay mobile. Next PostNext STRETCHING – WHAT DOES IT TAKE TO BECOME FLEXIBLE LIKE A GYMNAST ?